The Truth Pack - Both Movies for a special discounted price! 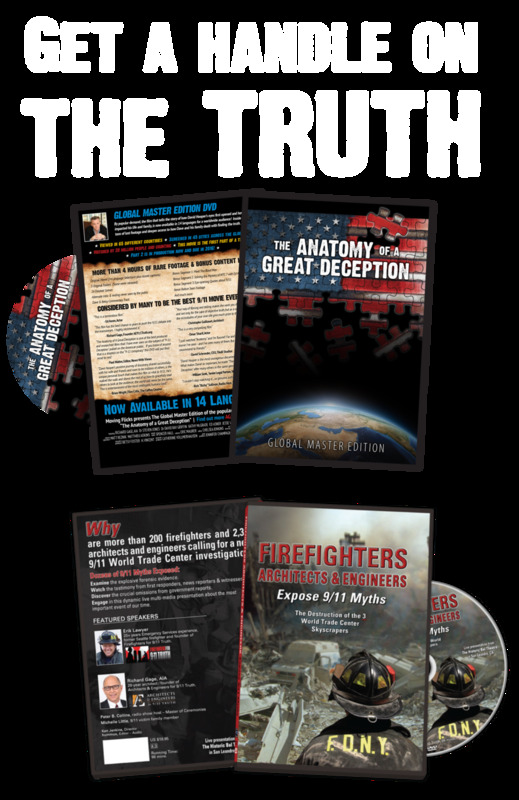 The Truth Pack set marries two brand new DVD releases into a unified “tool” with its main purpose being to open the eyes of those still unaware of the inconsistencies surrounding 9/11. The entire presentation was assembled to gently and logically walk the viewer through both the scientific and emotional complexities that can be overwhelming, keeping many from looking deeply enough. The two DVDs work as a well-balanced mix of science and story. In other words, the Truth Pack is designed to win the hearts and minds of anyone who watches it. It’s also meant to be a cornerstone piece for anyone who collects or cares about 9/11-related works. If there’s only one thing you ever show your skeptical friends, this should be it. Start with The Anatomy of a Great Deception, then watch Expose 9/11 Myths. Once they watch, the debate will be over. This effect has been reported, albeit anecdotally through emails and messages by hundreds of people who watched the original Anatomy of a Great Deception DVD with skeptical friends or family members.